Spooks – Spooks came in to the rescue with 6 other feral and semi feral cats that were caught in Warwick and the site they were at was no longer safe. They were all trapped and neutered and all were rehomed as farm cats apart from two, Spooks and his sister Millie. Spooks had a mouth infection and bad teeth so most were removed at the vets and his recovery was successful. Millie had an offer of a cat only home/farm cat as she was friendly but timid so she went off to her new home. Spooks on the other hand had started making friends with Lucy and Luca and so became part of their group. 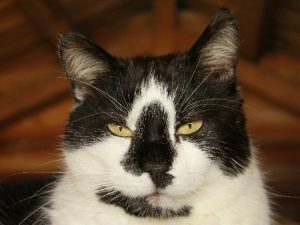 Spooks was continually overlooked as he was a semi feral with hardly any teeth so people thought he would not be any good catching mice but now he has been with us for a while, we now only play catching mice, which he is OK with. Spooks may have been a domestic as a kitten and then for whatever reason, joined this feral colony as he is now very much a loving, attention seeking cat! You can sponsor Spooks who is 10+ years old for £25.00 a year, or more if you want to.